Bogota: The ashes of Nobel laureate Gabriel Garcia Marquez will be buried in Cartagena de Indias, Colombia, said Juan Carlos Gossain, governor of the state of Bolivar. "A bronze bust of the author, in which Gabo's ashes will lie, was sculpted and donated by Katie Murray, a British artist close to Garcia Marquez," Xinhua quoted the governor as saying on Tuesday. 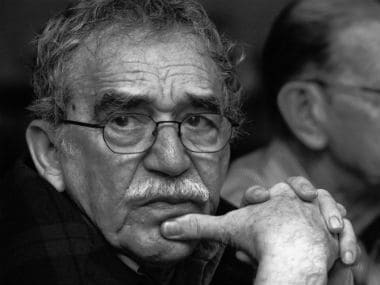 Garcia Marquez, born in March 1927 and commonly known as Gabo throughout Latin America, started out as a journalist and wrote many literary works. His best known works include One Hundred Years of Solitude, The Autumn of the Patriarch and Love in the Time of Cholera. He was awarded Nobel Prize in literature in 1982. He died on April 17, 2014 in Mexico city where he had lived since the 1960s. Since a state funeral was held for him in the capital, his ashes had remained there awaiting a decision over the final resting place for the late Colombian writer. According to Gossain, Cartagena de Indias (Cartagena) beat other cities to become the final resting place of Garcia Marquez based on the decision by his widow and children. Cartagena is the site of the family's ancestral home and the foundation to train journalists across Latin America. The remains will arrive on 12 December in Cartagena de Indias, where "Gabo" began his journalistic career in a local newspaper.